O, That's Good! 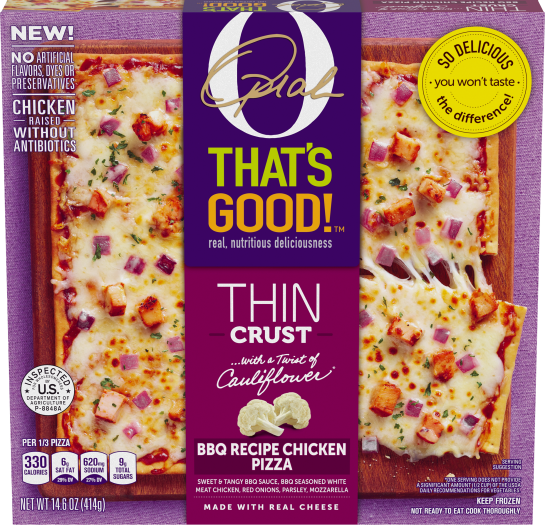 Thin Crust Pizza, BBQ Chicken, 14.6 oz | O, That's Good! 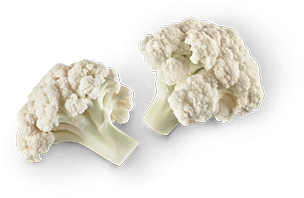 CRUST (ENRICHED WHEAT FLOUR [WHEAT FLOUR, MALTED BARLEYFLOUR, NIACIN, REDUCED IRON, THIAMINE MONONITRATE (VITAMIN B1), RIBOFLAVIN(VITAMIN B2), FOLIC ACID], CAULIFLOWER PUREE, EXTRA VIRGIN OLIVE OIL, WATER,PALM OIL, OAT FIBER, CONTAINS LESS THAN 2% OF SUGAR, SALT, BAKING POWDER[SODIUM ACID PYROPHOSPHATE, BICARBONATE SODA, CORN STARCH, MONOCALCIUMPHOSPHATE], CORNSTARCH, YEAST, NATURAL FLAVOR [CONTAINS CELERY], OLIVE OIL,ASCORBIC ACID); LOW-MOISTURE PART-SKIM MOZZARELLA CHEESE (PASTEURIZED PART-SKIM MILK, CHEESE CULTURE, SALT, ENZYMES); SAUCE (WATER, SUGAR, TOMATO PASTE, MOLASSES, VINEGAR, SALT, CONTAINS LESS THAN 2% OF CORN STARCH, GARLIC POWDER, LOCUST BEAN GUM, NATURAL SMOKE FLAVOR, ONION POWDER, SPICE [CONTAINS MUSTARD]); BARBEQUE SEASONED COOKED WHITE MEAT CHICKEN (CHICKEN BREAST MEAT WITH RIB MEAT, WATER, SUGAR, LESS THAN 2% TOMATO POWDER, RICE STARCH, SALT, SPICES [INCLUDING PAPRIKA AND CAYENNE PEPPER], CHILI POWDER [CHILI PEPPER, CUMIN, SALT, RED PEPPER, GARLIC POWDER, OREGANO], SMOKE FLAVOR, NATURAL FLAVORS, MALT EXTRACT); ONIONS, PARSLEY.